So I just got some new parts for my bike and I was jonesing to ride and see how the new set up felt. I'm running a D. Whip special on the back. He built me up a Odyssey Hazard Lite LHD with a 10 tooth one piece driver laced to a 48 Primo Balance Rim. Thanks to Pete F. I'm now running a 30 tooth Profile Imperial Titanium Sprocket in the front. I've had a bunch of people tell me that my 30-10 gearing is too much, but I ride road....my legs can take the abuse! 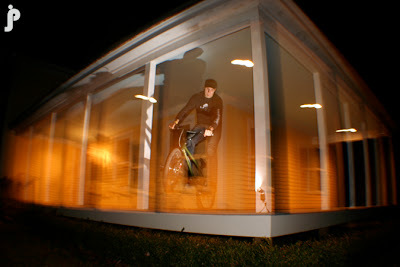 I rode around at a local school for a bit and then decided to huck some tricks off my friends porch. Jason just got a new lense and slave flash for his camera and he decided to play with them while I tooled around on my bike. 180 over the hedge gap off T's porch. Photo by J. Patrician.